It feels so good to be writing a recipe post again, after a long hiatus! I did not plan for the break to be this long… in fact I had “withdrawal symptoms” initially, but then life got so busy that I got used to not blogging after a few days. This summer has been a busy time. I have so much to share that I do not know where to start! 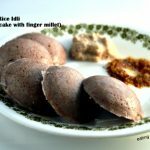 Some family heirloom recipes that I learned during my vacation trip to India, so many things that I tried, but just did not have enough time to write as a post. 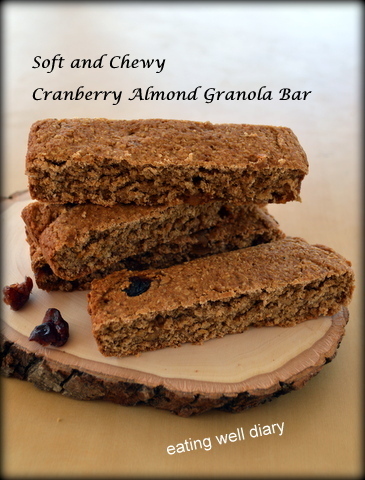 As I go about organizing them, here’s a great granola bar recipe that I make often for the kids’ evening snack. 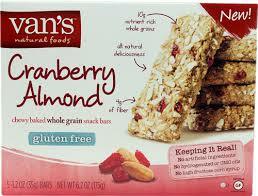 I am big fan of Van’s Chewy Almond granola bar. Unfortunately, they do not carry those anymore in our grocery store. So, here’s my copycat version, and my family loves it! 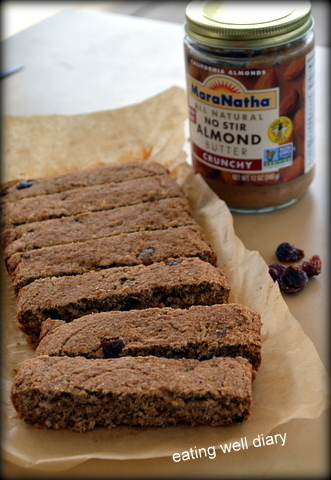 A bar made from whole figs, almond butter, dried cranberries and lightly sweetened with maple syrup and coconut sugar- what is not to like in it? Make it easily with readily available ingredients, in under 40 minutes! You can make the bars thick or slightly thinner according to your preference. Both varieties bake to perfection. 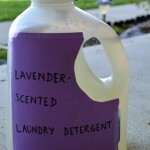 Make a big batch and store it away in the fridge! maple syrup or any liquid sweetener- 2 tbsp. 1. Cut figs into pieces and soften them by pouring 1 cup of hot water on it. 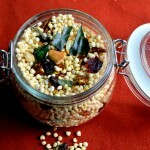 Make a paste of it in a small blender or spice grinder. 2. Grind the oats in a blender or food processor to a coarse mixture. 3. Add flaxseed powder or psyllium husk to the powder. 4. In a bowl combine wet ingredients: applesauce, fig paste, coconut sugar, maple syrup. Add sea salt to it and mix well. 5. Add the dry oat powder to the wet mixture. Add additional water if necessary to make a thick spreadable dough. 6. Pre-heat oven to 350 °F. 7. 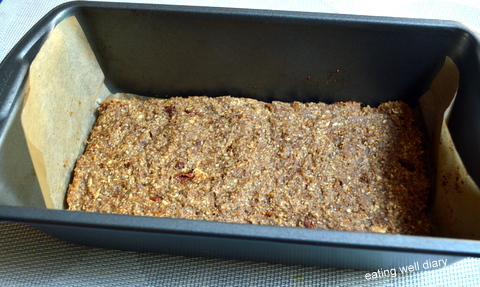 Spread the mixture in 2 loaf pans lined with overhanging parchment paper. 8. Bake for 20 -22 minutes or till the edges turn brown. 9. Cool completely and cut into rectangles. Store in a fridge to last a few weeks. Taking these beauties to Fiesta Friday #132 co-hosted by Sandhya @Indfused and Nancy @ Feasting With Friends. Come on over and enjoy all the good food at the party! 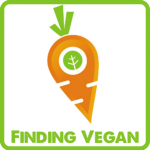 Also sharing at Plant Based Link Up #98 at Urban Naturale. 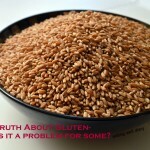 The Truth About Gluten- Why Is it A Problem For Some People? i make granola bar every now and then..i havent made one in a long time. your recipe sounds fantastic!!! on a side note – on apple sauce, did you mean 1/4 cup instead of 1 cup? Thank you, Dixya. The applesauce is actually 1/2 cup, or one 4 oz (113g) portion. Thank you for bringing this to my attention! I am so making it Apsara! 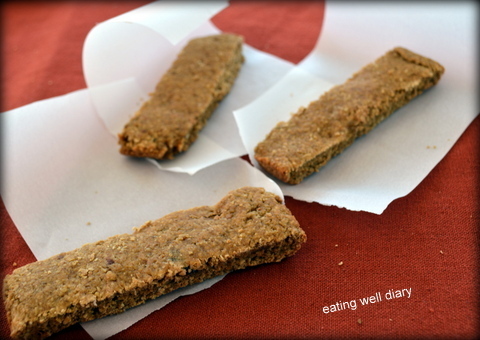 I love oats and honey granola bars. These look delicious and homemade is always the best! Who can resist such a delectable dessert! I could eat them every day! 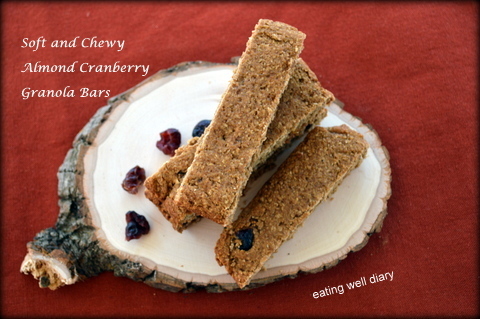 I am so glad you shared your healthy, yummy Soft and Chewy Cranberry Almond Granola Bars recipe with us at the Plant-Based Potluck Party. I’m pinning and sharing. This is great to make with the many home grown figs & I don’t know what else to do with them!! These look delicious! The perfect healthy snack. So much better than store-bought. Thank you Melissa. Thanks for stopping by too!